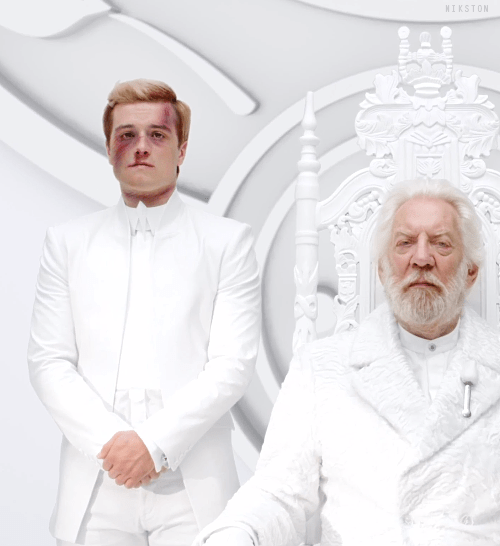 President Snow’s address to Panem is our first look at Mockingjay Part I, set to be released on the 21st of November 2014, the PSA-style Capitol TV-spot is all about affecting an air of peace and prosperity while offering (not so) veiled threats to anyone in the districts showing, or even thinking about, dissent towards the Capitol. Holy Propaganda, Batman. “But if you resist the system, you starve yourself.” This is an interesting approach, the marketing team have taken, in promoting the upcoming first part of the final installment of the phenomenon that is The Hunger Games. In conjunction with the movie posters, ‘sanctioned by the Capitol Ministry of Information’ released earlier, the marketing campaign is naught but propaganda for the fictional dictatorship that gives you the most uneasy feeling. It’s creeptastic, really. Most importantly, and for readers of Suzanne Collins’ series- more emotionally distressing because of what we know, as the camera pans up we see Peeta, standing beside Snow with a blank expression on his beautiful face. His presence in the spot isn’t a symbol of solidarity, nor is it just to reassure non-reader fans of the films that he’s still alive (well, it’s a little bit of that), it’s a message to Katniss and to the rebellion. We have Peeta, tread lightly. As President Snow utters the Capitol’s words “Panem today, Panem tomorrow, Panem forever,” Peeta finally looks into the camera, however his blank expression remains. It’s a haunting thing to be left with, those who haven’t read the books have no idea what Peeta is thinking.